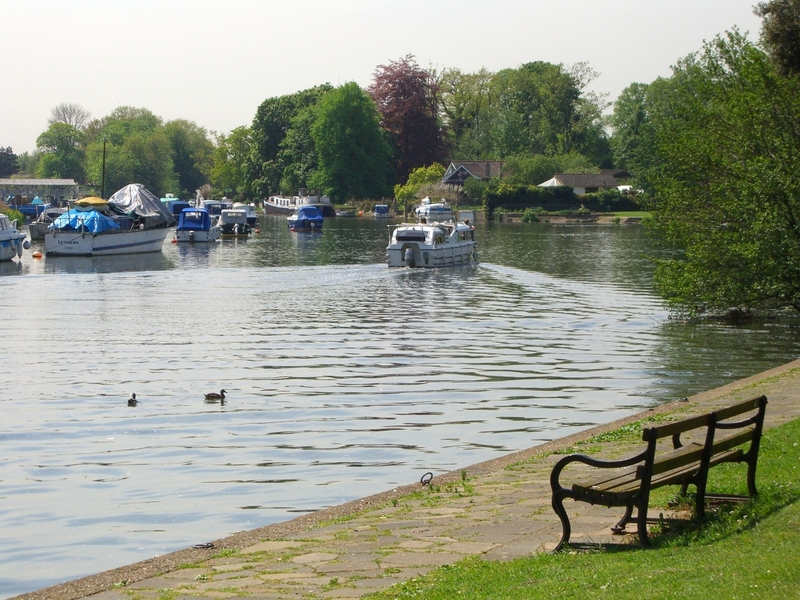 Chertsey is a market town on the banks of the Thames which grew around a Benedictine Abbey founded in 666. The Vikings destroyed the Abbey in 871 killing the Abbott and 90 monks. King Edgar refounded the Abbey in 964 and some ruins, mostly the gardens, still remain. The Abbey fishponds remain and fill with water in wet weather. In 1852 some of the Abbey’s tiles, some of the finest medieval tiles in England, were uncovered and are now at the British Museum. The tiles show the stories of Sir Tristram and Richard Coeur de Leon. 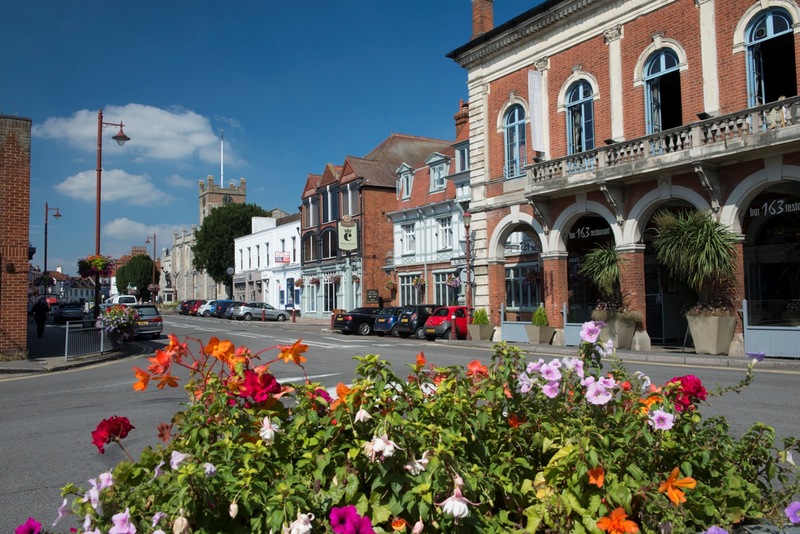 grow as a market town. In the C18th and C19th it was an important clock making centre and also had a bell foundry and an iron works. The town’s curfew bell, once a feature of the Abbey, is the subject of one of Queen Victoria’s favourite poems. Blanche Heriot saved the life of her lover by hanging from the clapper of the bell and preventing it from striking. Her lover had been due to be executed at the striking of the curfew at sunset. An interesting feature for visitors is the monument to Blanche Heriot by Chertsey Bridge. Henry I, first granted charters for Markets and Fairs to the Abbey in 1249, and the town has thrived on markets ever since. Today there is a Saturday Market in Windsor Street. There are historic inns in the town. On the road between London and Windsor, Chertsey was a popular staging post. The Swan in Windsor Street dates from 1595, while the George in Guildford Street, now named after George III, dates back to the C13th. In nearby Thorpe Village is St Mary’s medieval church. A Roman urn found in the churchyard dates from the C2nd. Thorpe or ‘Torp’ is mentioned in the Doomesday book of 1086. The church has a crenelated tower dating from C16th. The Church web site tells details of the building. Information for visitors. Shepperton lock, two miles east of Chertsey, on the River Thames dates from the early C19th. Built to relieve congestion and flooding, the first lock was oak and manually operated. Today the modern stone lock has hydraulic operation. The area is a popular riverside venue. In 1689, Thomas Wood built a mansion, Littleton Park, in a 60 acre park here. Two hundred years later, Sir Richard Burridge, MD of Harrods, refurbished the mansion using timber from the original Houses of Parliament. 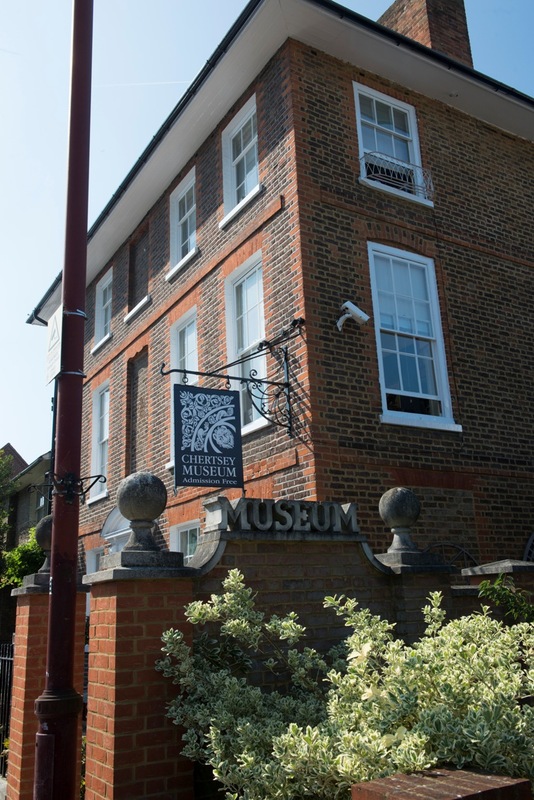 In 1931, the mansion became the home of Flicker Productions and eventually Shepperton Studios, the home of independent films, which is now part of The Pinewood Group. There is evidence however of early settlement in this area. An Anglo Saxon iron sword found here is now in the Museum of London. The place name, which is in the Doomesday Book, suggests shepherds. Previous PostVisitWiltshire is producing a series of new guides for visitors to put the county on visitor’s map. Next PostWith Spring on the doorstep there’s no better time to take up the dog lead and walk off the winter blues.